If you had trouble finding Western bean cutworm (WBC) egg masses when scouting back in late July and early August, you probably won’t be able to miss those that escaped your search when you are checking your corn now. Many reports are coming in this year that WBC infestations are being found in a wider area than we usually see in Ontario. Unfortunately the coldest, snowiest winter in the Great Lakes region in 35 years didn’t seem to have a negative impact on the overwintering success of this pest population. The typical hot-spot areas for WBC certainly had heavy infestations this year but damage is being found all over southwestern Ontario – e.g. in Central Lambton County, further southwest into Chatham-Kent, Oxford, etc. (I was told they even showed up for the Outdoor Farm Show!). I suspect that we are seeing more of this pest outside its typical range this year due to later planting dates outside the hot-spot areas that were attractive to female moths looking for pre-tassel corn to lay their eggs on. 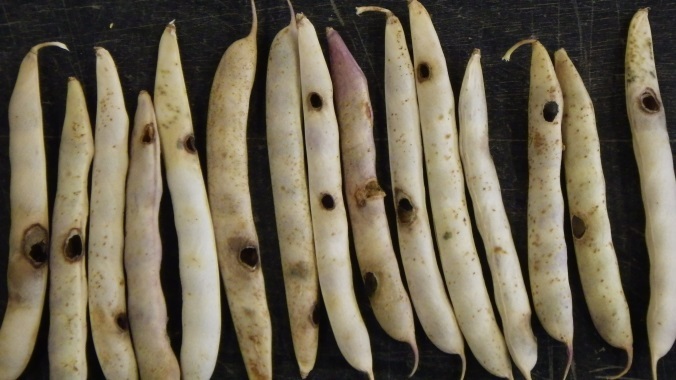 This is also the first year that we have found multiple fields of edible beans with easily visible WBC damage in Ontario (Figure 1). 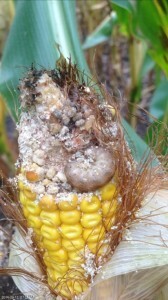 Check your fields for WBC and ear rots now and consider harvesting early to stop mould growth. Adjust your combine to discard lightweight mouldy kernels and dry mouldy corn as soon as possible. This growing season there were good environmental conditions for development of ear mould fungi like Fusarium graminearum (Gibberella), Fusarium verticillioides/F. 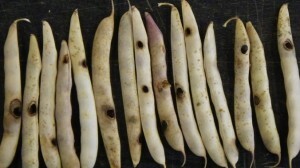 proliferatum and we expect that there could be pockets of infection in some areas of the province that could result in mycotoxins like deoxynivalenol (DON or vomitoxin), fumonisins and moniliformin to contaminate the grain. 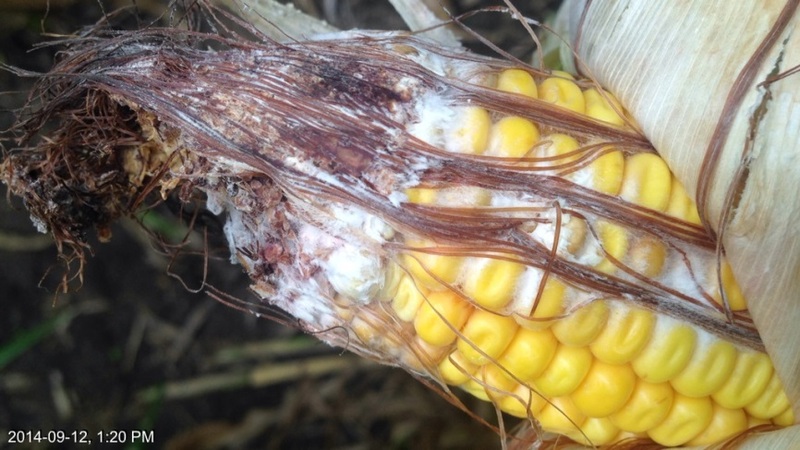 DON accumulation is most strongly linked to hybrid susceptibility; however, ear feeding damage like that caused by WBC can lead to increased mycotoxins (Figure 2). Bt corn fields need to be checked too! We are concerned about the effectiveness of the Cry 1F Bt event found in Herculex® and SmartStax® corn hybrids for controlling WBC (Figure 3). The WBC population has never been completely susceptible to this Bt protein, therefore, the chance of resistance development increases with repeated use of this trait. The use of a high-dose Bt event such as Vip3A (on its own or stacked with Cry 1Ab or Cry 1F) will likely be most effective in preventing resistance development. Foliar insecticides have given excellent control of WBC on non-Bt corn in most cases, but application timing is important.